It’s the beginning of the quarter. You just set your team’s new lead goals, and you're starting to think about what steps you're going to have to take to achieve them. While whipping up some compelling content and placing lead generation forms in all the right places sounds like a feasible strategy, rest assure that there's more to be considered. Here's the thing: Not all forms and pop-ups are created equal. In other words, factors like display type, trigger, timing, and device type can have a big impact on your ability to encourage your website visitors to sign up for anything. Try out our free marketing tool that helps you test out various types of popup CTAs and gives you information about your site visitors. 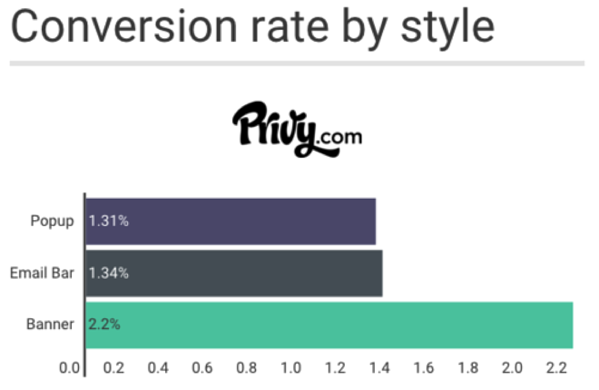 To help shed some light on the current state of email list growth, our team at Privy took a look at six months worth of data, across 5,000 of our most active users. As a result, we were left with a ton of interesting email capture trends and takeaways. 1) 'Enter to Win' campaigns offer the most incentive to join your email list. Sign-up campaigns: This is a simple “join our email list" form. In some cases, it may mention that the subscriber can expect great content, but it typically refrains from using a specific offer to incentivize conversion. Offer campaigns: Just like it sounds, an offer backed-campaign uses the promise of a specific piece of content or a promo code/coupon in exchange for conversion. Think: “Download this whitepaper." 'Enter to Win' campaigns: This is more of a sweepstakes type giveaway, where at the end of the campaign schedule, a winner, or group of winners will randomly be selected. 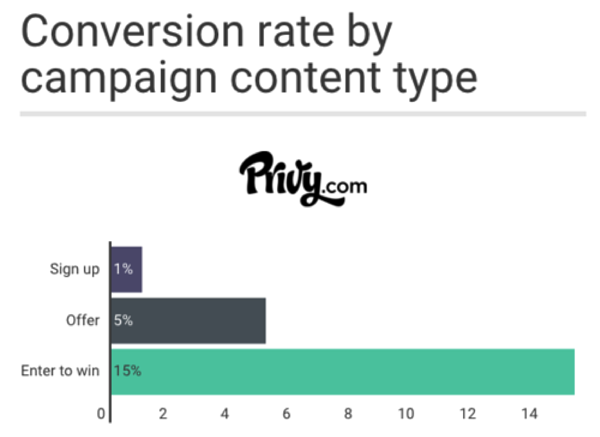 According to our research, 'enter to win' forms offer the most incentive to join -- converting at an average of 15%. While it's likely that the success of this particular type of content can be tied back to our human desire to win something -- anything -- at a single stroke, there's something larger that we can learn from this. If visitors are driven to "win," that might mean that we could benefit from using language that positions our offer, whether it be a piece of content or a subscription, as something that will help people succeed -- something that will help them get a leg up on the competition. Remember: Depending on your brand and campaign intention, not all of these campaigns will make sense for you. Regardless, these are great benchmarks to use when comparing your own campaign results. Pop-up: Also referred to as a lightbox, this display type often appears in the center of a website or "flies out" in the corner. Bar: A full width bar that typically sits either on top of your site, or at the bottom. Banner: A more subtle interaction that sits at the top or bottom of a site, but starts in a "hidden" state until triggered, and then rolls into sight. According to our results, the banner outperforms both the pop-up and email bar. While it's easy for visitors to feel bombarded by a pop-up, or overlook an email bar, the banner display seems to strike a happy medium between the two. Want to test out various types of pop-up CTAs on your website and learn more about your site visitors? 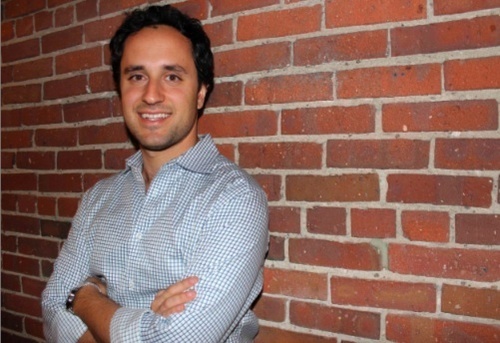 Try HubSpot's free lead capture tool, called Leadin, which you can set up in minutes. 3) Tab CTAs delivered higher conversion rates than both time-based and exit-intent CTAs. Timer: Time-based triggers allow you to specify when to display a list growth CTA, based on how long a visitor has been on your site. Exit intent: Exit intent popups track your visitor's mouse movement to trigger a CTA when they appear to be leaving your website (moving their mouse towards the X). Tabs: This trigger typically appears within your site's layout -- in the corner, along the bottom of the page, etc. -- and prompts visitors to clickthrough to reveal a form. Why the noticeable difference? While time-based triggers and exit-intent campaigns have proved useful for many businesses, tab triggers require your visitors to proactively clickthrough to access a form. In other words, those who take action are typically more engaged -- hence the higher conversion rate. 4) Device specific design and targeting can make a big difference. For many businesses, the buyer's journey starts on one device and ends on another. With this multi-device process in mind, it's important that we're planning our email list growth campaigns accordingly. As your might expect, our research revealed that desktop traffic converted better than mobile traffic. 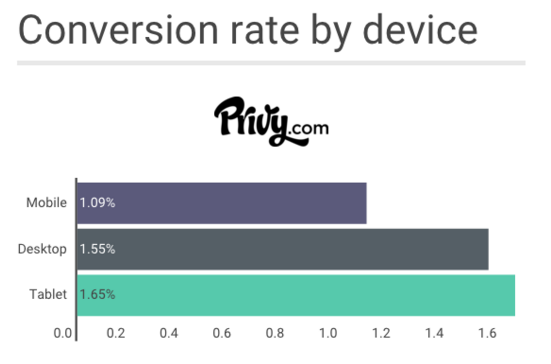 However, we also found that tablet users actually converted .10% better than desktop users. How can you use this information to inform your strategy? Above all else, make sure that your list growth campaign contains optimized conversion opportunities across all devices. While an image-heavy pop-up might perform well on desktop, it's best to keep mobile interactions clean and simple. 5) New visitors are more likely to convert than repeat visitors. Like forms and pop-ups, not all traffic is created equal. 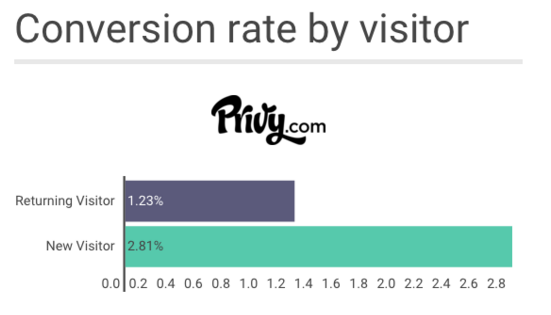 In fact, we found that new visitors convert at 2.81%, compared to repeat visitors converting at 1.23%. When crafting or tweaking your list growth campaigns, consider using audience attributes to determine whether or not they should see a particular campaign. For example, limit welcome offers to first time visitors, and target returning visitors with more advanced content. By limiting the display based on how many times someone has visited your site, you're ultimately creating a better, less frustrating user experience. Like anything else in marketing, you need to start somewhere. Implement your first lead capture campaign, and start tracking conversion rates. You can always tweak your design, targeting, and content to turn up the dials later. For even more on Privy's findings, check out the comprehensive report here.